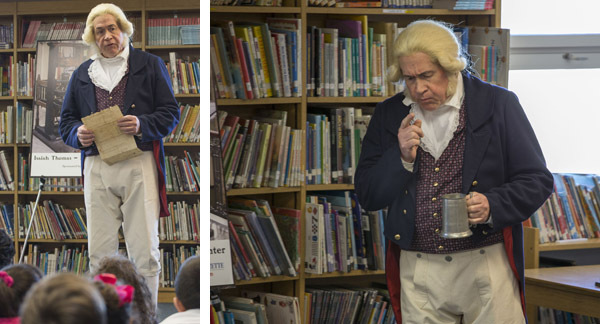 Inspire your students to study historic primary source materials with a dynamic theatrical presentation about Isaiah Thomas (1749-1831), a printer who was instrumental in starting the American Revolution and then, as the foremost publisher in the Early Republic, created a uniquely American literature and culture. In Isaiah Thomas - Patriot Printer a professional actor, wearing a costume and wig, comes directly into your classroom and impersonates Isaiah Thomas. In an interactive presentation, Thomas tells his own life story and the history of our nation's founding through selected documents that the real Thomas either created or collected. All the historic documents and graphic images described in the theatrical presentation are contained in the online curriculum guide and come from the collections of the American Antiquarian Society (AAS), a national research library of American history, literature and culture. Your students hear Thomas read from and talk about these documents, and then explore them on their own through the included facsimiles and lesson plans developed by classroom teachers. Isaiah Thomas - Patriot Printer encourages students to use their research, investigative learning, and critical thinking skills. The program also engages students who may have problems reading and learning in traditional ways through the excitement of a live theatrical presentation, and by the variety of learning activities included in the online curriculum guide. Isaiah Thomas - Patriot Printer adheres to the National Standards for History, the Curriculum Standards for Social Studies developed by the National Council for Social Studies, and to the history and social science curriculum frameworks and standards for the states of Massachusetts, Connecticut, Vermont, and New York. 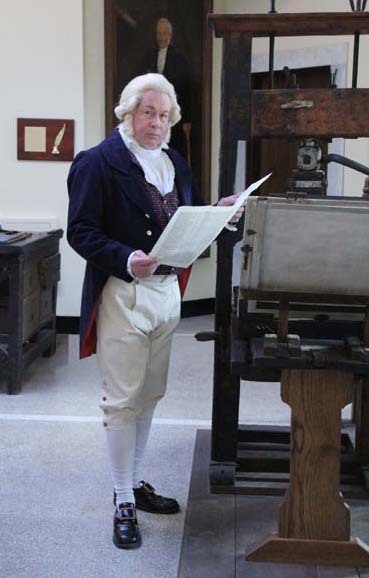 With funding generously provided by the Telegram & Gazette, the Isaiah Thomas – Patriot Printer program is going into every fifth-grade classroom in the Worcester Public Schools (WPS) during the spring of 2019. It will reach thirty-three schools and approximately 1,800 students. This WPS tour is part of an initiative known as Culture LEAP (Learning through Education and Arts Partnerships) that seeks to offer intensive curriculum based cultural experiences to all students in a given grade. Culture LEAPs are collaborative efforts by the Worcester Public Schools, a working group of the Worcester Cultural Coalition composed of twenty-two education directors from the region’s cultural organizations, and the Worcester Education Development Foundation, Inc. Currently there are eight LEAPS impacting students in seven grades. The Isaiah Thomas- Patriot Printer LEAP is funded completely by the Telegram & Gazette. The Telegram & Gazette also funded the Isaiah Thomas – Patriot Printer tour of every fifth-grade classroom in the Worcester Public Schools (WPS) during the spring of 2017. AAS has embarked on a project that aims to create an interactive educational website inspired by the Isaiah Thomas – Patriot Printer program. A prototype of one segment of that website—an exploration of Isaiah Thomas’s indenture—is now available. Included in this prototype is a short film depicting adult Isaiah talking about his apprentice indenture and then flashing back to when he first entered into the contract. There is also an interactive document explorer that allows students to examine the indenture document interactively through zooming features, transcriptions, and clickable hotspots that provide information about the physical document and its textual content. The indenture is further contextualized through related primary sources, links, and lesson plans. Once the site is completed, each module will use this format to examine a different primary source document of significance to Isaiah and the nation.